The epic tale of victory and defeat... The story of the Ramayana had been told innumerable times. The enthralling story of Rama, the incarnation of God, who slew Ravana, the evil demon of darkness, is known to every Indian. And in the pages of history, as always, it is the version told by the victors, that lives on. The voice of the vanquished remains lost in silence. But what if Ravana and his people had a different story to tell? The story of the Ravanayana had never been told. Asura is the epic tale of the vanquished Asura people, a story that has been cherished by the oppressed outcastes of India for 3000 years. Until now, no Asura has dared to tell the tale. But perhaps the time has come for the dead and the defeated to speak. For thousands of years, I have been vilified and my death is celebrated year after year in every corner of India. Why? Was it because I challenged the Gods for the sake of my daughter? Was it because I freed a race from the yoke of caste-based Deva rule? You have heard the victor s tale, the Ramayana. Now hear the Ravanayana, for I am Ravana, the Asura, and my story is the tale of the vanquished. I am a non-entity invisible, powerless and negligible. No epics will ever be written about me. I have suffered both Ravana and Rama the hero and the villain or the villain and the hero. When the stories of great men are told, my voice maybe too feeble to be heard. Yet, spare me a moment and hear my story, for I am Bhadra, the Asura, and my life is the tale of the loser. The ancient Asura empire lay shattered into many warring petty kingdoms reeling under the heel of the Devas. In desperation, the Asuras look up to a young saviour Ravana. Believing that a better world awaits them under Ravana, common men like Bhadra decide to follow the young leader. With a will of iron and a fiery ambition to succeed, Ravana leads his people from victory to victory and carves out a vast empire from the Devas. But even when Ravana succeeds spectacularly, the poor Asuras find that nothing much has changed for them. It is when that Ravana, by one action, changes the history of the world. I was born in a quaint little village called Thripoonithura, on the outskirts of Cochin, Kerala. Located east of mainland Ernakulam, across Vembanad Lake, this village had the distinction of being the seat of the Cochin royal family. However, it was more famous for its hundred odd temples; the various classical artists it produced and its music school. I remember many an evening listening to the faint rhythm of Chendas from the temples and the notes of the flute escaping over the rugged walls of the school of music. Gulf money and the rapidly expanding city of Cochin have, however, wiped away all remaining vestiges of that old world charm. The village has evolved into the usual, unremarkable, suburban hell hole, clones of which dot India. Growing up in a village with more temples than was necessary, it was no wonder that the Ramayana fascinated me. Ironically, I was drawn to the anti-hero of the epic Ravana, and to his people, the Asuras. I wondered about their magical world. But my fascination remained dormant for many years, emerging only briefly to taunt and irritate my pious aunts during family gatherings. Life went on... I became an engineer; joined the Indian Oil Corporation; moved to Bangalore; married Aparna and welcomed my daughter Ananya, and my son, Abhinav. But the Asura emperor would not leave me alone. For six years he haunted my dreams, walked with me, and urged me to write his version of the story. He was not the only one who wanted his version of the story to be told. One by one, irrelevant and minor characters of the Ramayana kept coming up with their own versions. Bhadra, who was one of the many common Asuras who were inspired, led and betrayed by Ravana, also had a remarkable story to tell, different from that of his king. And both their stories are different from the Ramayana that has been told in a thousand different ways across Asia over the last three millennia. 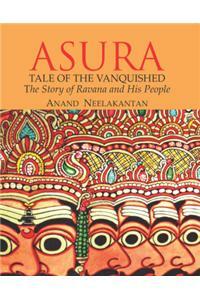 This is then Asurayana, the story of the Asuras, the story of the vanquished.